Bust out the foam finger, slip into your jersey, and don&apos;t forget the tickets! Home to an extensive collection of sports teams and organizations, North Texas is a fan&apos;s paradise. Cheer for major league baseball, college and professional football, as well as NASCAR and IndyCar Series races. With so many things to root for, it&apos;s no surprise that Fort Worth and the surrounding area are home to some of the world&apos;s best sports venues. Rev the engines! Each year, Texas Motor Speedway hosts two NASCAR Sprint Cup Series races drawing an estimated 400,000 spectators and making the speedway home to the largest sporting events in the whole state. Grab a cold one; the action here heats up with every lap. Over the years, Texas Motor Speedway has put its own Lone Star twist on victory lane celebrations including cowboy hats for the winning driver, owner and crews, as well as a pair of six-shooters for Sprint Cup and IndyCar Series winners and a Henry Repeating Arms Rifle for the pole winner. 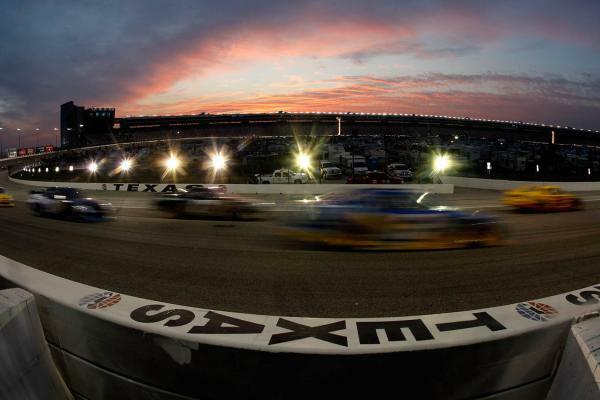 Although the home of the Dallas Cowboys looms large on the horizon, Texas Motor Speedway eclipses it four times over. Built in 1997, this 1,500-acre colossus holds more than 190,000 screaming fans in addition to a host of amenities including an exclusive tailgating area called Pit Stop Park. Not to be forgotten, the Speedway recently added "Big Hoss," the track&apos;s high-definition monitor at 20,633-square-foot, to its list of fan luxuries. In addition to the 1.5-mile track-built for stock cars, trucks and open-wheel racing-Texas Motor Speedway maintains a .4-mile dirt track as well as the paved .2-mile Lil&apos; Texas Motor Speedway, home to Legends, Bandolero and Thunder Roadster races in addition to racing and driving schools for adults and children. Home to the year-round Stockyards Championship Rodeo, Cowtown Coliseum hosts a popular weekly rodeo and other special events. Opened in 1908, the Coliseum became the home of the world&apos;s first indoor rodeo and has been knocking the spurs off visitors ever since. Witness a truly authentic Western experience here, with bull riding, tie down roping, barrel racing, bronc riding, and calf and mutton scrambles for the kids, all in air-conditioned comfort thanks to a 1986 refurbishment that also includes production lighting and sound. Spend some time wandering the corridors, too-the Texas Rodeo Cowboy Hall of Fame houses its memorabilia here. AT&T Stadium, headquarters for one of the most storied franchises in professional sports history, was built in 2009 at a cost of $1.2 billion. This behemoth spans 3.1 million square feet over 150 acres and seats 80,000 fans; however, with the addition of standing room and temporary seating, that number swells to 100,000-making it the largest NFL stadium in the country. Spanning the length of the stadium are two, 800-foot canted glass walls capped off by two end zone entry plazas. Each end zone boasts a 120-foot, five-panel clear glass retractable door, recognized as the tallest moveable glass doors in the world. Take a peek between plays. In the middle of the stadium-beneath an expansive retractable roof measuring 410 feet long-hangs a 600-ton high-definition screen 60 yards long between each side&apos;s 20-yard line. AT&T Stadium is worth a visit post-Super Bowl and pre-preseason. One of the stadium&apos;s most unique features is its museum-quality contemporary art collection found throughout the main concourse and club levels. Works here include nationally and internationally recognized artists personally selected by team owner Jerry Jones and his family. Visitors can view 16 commissioned site-specific pieces-including Anish Kapoor&apos;s 35-foot-diameter concave mirror called "Sky Mirror"-along with 42 additional works acquired for the stadium. 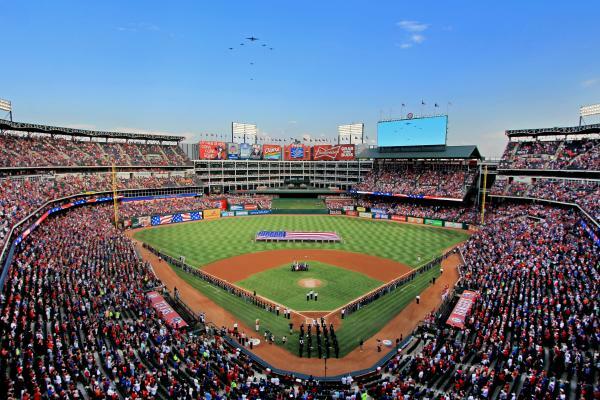 Although the stadium is roughly 1.4 million square feet in size, the proximity of the fans to the action at Globe Life Park in Arlington is among the closest in major league parks. And Texas Rangers fans sure are grateful. Globe Life Park is a retro-style stadium reminiscent of older ballparks from baseball&apos;s bygone years. Nowhere is this more apparent than in the two-tiered homerun porch in right field, complete with steel columns and an overhead roof. Enjoy a game from here, in any of this open-air ballpark&apos;s 48,114 seats or watch the game from inside one of the stadium&apos;s four well-furnished clubs. The Capital One Club is a newly renovated, two-tiered event space that offers unmatched views from behind home plate, while the floor-to-ceiling windows of the Hyundai Club in center field offer their own perspective on the action. Since it was built in 1994, Globe Life Park has hosted two World Series Championships, the 1995 All-Star Game and an ever-expanding roster of outstanding players. Therefore, a visit requires a between-innings stroll through the plaques, artifacts and photographs of the Texas Ranger Baseball Hall of Fame. Just four miles from downtown, on the beautiful Texas Christian University campus, is Amon G. Carter Stadium, one of Fort Worth&apos;s most historic sports complexes and home to one of the most exciting college football teams in the country. The stadium was built in 1929 after Fort Worth Star Telegram owner and publisher Amon G. Carter quietly led the charge to raise $150,000 of the 22,000-seat stadium&apos;s total cost. The decades that followed saw a number of stadium expansions until, in 2012, the stadium saw a $164-million-dollar renovation bumping seating capacity to 45,000, enhancing field views throughout the stadium and highlighting the stadium&apos;s 1930s style of southwest art deco prevalent throughout the city. Moncrief Field has witnessed an abundance of TCU Horned Frog victories by a team with 17 conference championships and 31 bowl games to its name. The game day atmosphere begins with Texas-style pregame events in the stadium&apos;s parking lot hours before kickoff, culminating at Frog Alley on the east side with live music and games. The fun continues with the stadium&apos;s 120-decible Frog Horn, the fan favorite Super Frog mascot, and the always-lively student section near the TCU band. After games the stadium&apos;s neighboring bars and eateries, including the popular sports bar Buffalo Bros and the epic hamburger joint Dutch&apos;s, extend the fun into the fifth quarter. Colonial Country Club is Fort Worth&apos;s (and arguably the state&apos;s) premier golf course and is consistently ranked among the very best golf courses in the country. It even hosted the 1941 U.S. Open. Legends of the course include Arnold Palmer, Jack Nicklaus, Lee Trevino and Ben Hogan (the Ben Hogan Museum is here). Colonial sits west of Downtown Fort Worth along the Trinity River. The always-immaculate, well-groomed fairways of this 7,010-yard par 70 country club course cut through pecan trees on their way to small, well-bunkered greens for more intimate surroundings than most other PGA courses. The fifth hole, the last in a rough stretch known as "The Horseshoe," is one of the top ranked holes in the country. Although Colonial is a private course, it does host the Fort Worth Invitational every year. A staple since 1946, it&apos;s the longest-running PGA Tour event that&apos;s still played on its original site. Ben Hogan won the event and the famed plaid jacket five times, adding to the great legacy of this elite event. Visitors are welcome to watch and cheer as their favorite top players tee off. Just two miles from downtown, in the heart of Fort Worth&apos;s Cultural District, is a massive 120-acre multipurpose entertainment complex known as the Will Rogers Memorial Center. Established in 1936 and named after American humorist and writer Will Rogers, the center plays host to a variety of cultural, corporate, educational and sporting events including world-class equestrian and livestock shows all attracting more than 2 million visitors to Fort Worth each year. The center&apos;s event facilities and exhibit halls include the 2,856-seat Will Rogers Auditorium and the 5,652-seat Will Rogers Coliseum along with 94,000-square-foot Amon G. Carter Jr. Exhibit Hall and 18,000 square feet of ballroom and meeting space in Round-Up Inn. Additionally, the center boasts state-of-the-art equestrian facilities, three show arenas, 2,500 horse stalls and 2,250 cattle ties. The center&apos;s most notable event is the annual Fort Worth Stock Show and Rodeo held here since 1944. Established in 1896, this 23-day event is one of the oldest stock shows in the country and includes professional rodeo events, livestock auctions and commercial exhibits. Other annual events held at Will Rogers Memorial Center include equestrian shows like the Appaloosa Horse Club World Championship Show, livestock shows like the Texas Longhorn Breeders Association of America World Show, and a long list of popular events from Golden Glove boxing to the Fort Worth Kennel Club Dog Show. In the end, it doesn&apos;t really matter what sport you fancy or even what team you prefer-sports and leisure are serious business in North Texas. Team up with Fort Worth to get in on the action-face paint optional. Learn more about the sports scene in Fort Worth.